ABC: America's Funniest Home Videos score a 0.9 A18-49 rating. The Behind the Magic: Snow White special scored a 0.7 A18-49 rating. Blood & Oil's season (series?) finale scored a 0.7 A18-49, and for those of you keeping score, that's a new series low. Ending the night is Quantico's midseason finale, which ticks up to a 1.3 A18-49 rating. CBS: In likely inflated preliminary ratings, 60 Minutes scored a 1.6, Madam Secretary a 1.3, The Good Wife a 1.1, and CSI: Cyber a woeful 0.8 A18-49 rating. FOX: The Simpsons scored a 2.4 A18-49 after football overtime, Brooklyn Nine-Nine scored a 1.7, Family Guy a 1.7, and The Last Man on Earth a 1.3. NBC: Sunday Night Football wins the night with a 6.4, 6.5, and a 5.9 in A18-49 for each hour. Expect the final football numbers once the final adjusted numbers come out. Update: Sunday Night Football adjusts up to a 7.0 A18-49 rating. 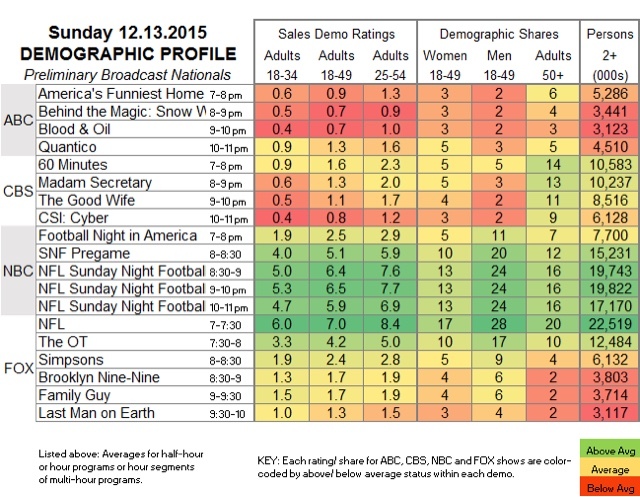 Blood & Oil adjusts up to a 0.8, the old series low for the show. Say bye bye, Blood & Oil.